UW OneDrive for Business (formerly UW SkyDrivePro) provides a simplified method of sharing files with individuals, but it may work better for you if you use UW Groups to manage permissions for UW OneDrive for Business resources. Using a group to grant access to files, folders, libraries, lists and sites streamlines sharing with the same set of people because it frees you from having to specify each individual UW NetID when you want to share something new. Privacy protected groups (for example, course groups) are groups that don’t make group members visible. Such groups are not synchronized with UW OneDrive for Business, so they are not available for use in UW OneDrive for Business. To check whether a group is privacy protected, go to https://groups.uw.edu. To locate a particular group, click Find groups or My groups. Select the link to a particular group and view its general properties. Scroll down to the bottom of the page to view Access Control. If the Membership viewers property says “no restrictions,” the group will be available for use in UW OneDrive for Business. Your department may already be using UW Groups to manage other services at the UW. Be sure to check with your department’s IT staff, or any other department administrators that may be in charge of UW Group creation. You may be able to use a group that already exists instead of creating a new one. Searching available groups is also a great way to see what groups have already been established. You may search for groups using the UW Groups Service. If you would like to establish a new UW group, start at the UW Groups Web page, which includes an overview of what groups are and how they are typically used. If your department does not yet use UW Groups, learn how to choose a Home Group. If you’re ready to create a new group, refer to the step by step instructions. You can grant permissions to resources in UW OneDrive for Business in the same way that you would share with an individual. The example below shows how C. Garfield would share the Claims-Authentication folder with the UW-IT Academic and Collaborative Applications unit. Open UW OneDrive for Business in a web browser. Select the ellipsis to the right of the Claims-Authentication folder. 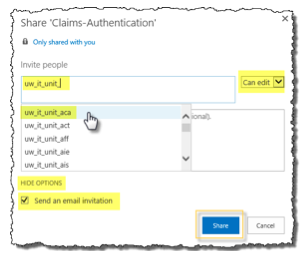 On the Share ‘Claims-Authentication’ window, type the group display name in the invite people box. A lookup box will display choices that match what you have typed. Select the UW Group that you want to share with. From the dropdown menu next to the invite people box, select either Can edit or Can view. Click SHOW OPTIONS. If you do not want to send an email to the whole group, clear the Send an email invitation check box. Note: Email will be sent only to UW Groups for which email is an active application. You will have to review the properties of the group in the groups service to see whether email is active or not. As of April 2017 The Microsoft Infrastructure team made a change in how UW Groups are displayed in SharePoint Online and OneDrive for Business. As a result of this change you select a UW Group in UW OneDrive for Business (or SharePoint Online), by entering the Group ID instead of the Display name. If you have difficulty finding a UW Group in UW OneDrive for Business or SharePoint Online then you should check the Group properties in the UW Groups service ( groups.uw.edu). Make sure that the group is not privacy protected group and that you are searching for the right Group ID. While you are viewing the properties of the group, check to see if the group membership includes other groups. If your group does contain other groups, you should check to make sure those groups are not privacy protected. 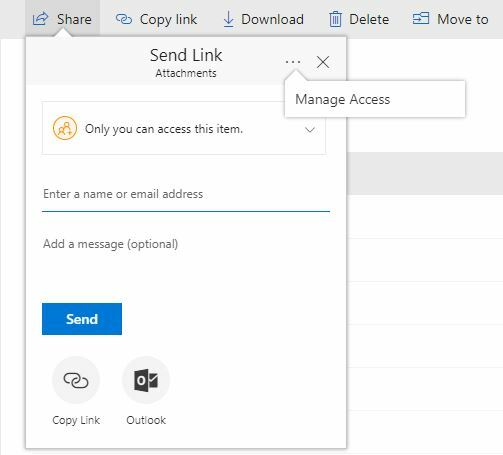 Microsoft maintains an excellent SharePoint Help page that describes how to share documents or folders in UW OneDrive for Business. You can follow the instructions in this help page and substitute your UW Group where the instructions mention an individual or other group. Changes to the membership of a UW Group may take up to 24 hours before they are reflected in UW OneDrive for Business. You cannot view the members of a UW Group in UW OneDrive for Business directly. You must use the UW Groups service to view group members. You can also create groups in UW OneDrive for Business (called SharePoint groups). You can add individuals and UW Groups to these SharePoint groups. Using SharePoint groups allows you to further streamline access to your UW OneDrive for Business resources. For more information on creating SharePoint groups, see these instructions, published on a UW-IT employee’s blog. This blog is accessible to everyone at UW, but you will have to log in because UW OneDrive for Business is not accessible to the public.